Workers pumped sand and concrete into a sinkhole that opened up over the weekend on the coast south of San Francisco, plugging most of it ahead of a storm expected this week. 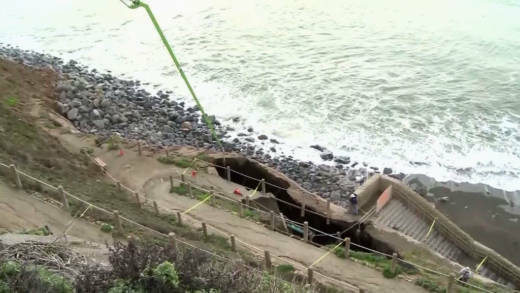 Monday's work came after the sinkhole emerged Saturday on a cliff in Pacifica. It closed access to a popular beach and caused concerns about recurring erosion due to heavy rains and high waves. NBC Bay Area reports that large waves, known as king tides, may have caused it. Weather forecasters say the king tides are expected to peak Tuesday or Wednesday. Officials don't have an estimated time for the beach's reopening. A Pacifica apartment complex was demolished in March after erosion along the cliffs made the area unsafe. City leaders later declared a state of emergency.